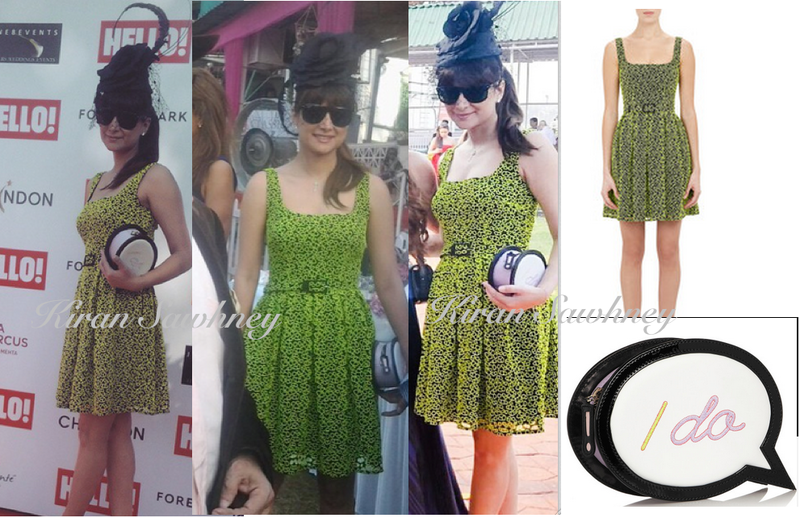 At Hello race event, Michelle was spotted wearing Christopher Kane black sleeveless A-line dress styled with fluorescent green eyelet overlay and buckle belt at waist. The dress has square neck front and back and box pleats at waist . The dress retails for $ 2095. She carried a Sophia webster's 'speech bubble' clutch. This candy-colored design is embroidered with a yellow, lilac and pink 'i do'/ 'i don't' motif on either side. It retails for $ 512. She teamed it with a fascinator, sunnies and Loubs.